After the failed coup: a second chance for Erdogan or the final end of the Turkish liberal democracy? A failed attempted coup happened while President Erdogan was in holiday on the Aegean Sea. Erdogan said was organized by Gulen “parallel state”, other parts suggested it was a hoax organized by Erdogan himself to increase even more its power. We don’t know who is right but one thing is certain: if it was not staged it was bad organized. With one surprising element: the image of military surrendering to civilians was a show of the strength of Turkish population. We don’t know yet though if it was also an image of the democratic health of Turkey or just an image of the increasing massive support that Erdogan has (not necessarily good for democracy, as past multitudes supporting strong leaders democratically elected teaches us). Now, after the military purge, Erdogan and the AKP have two paths: improve the democracy in Turkey creating a national reconciliation with the secular and leftist forces, giving back liberal freedoms to the press and the civil society and taking the lead again for a peace process on the Kurdish issue, or follow the Putin style: expansion of power towards the absolute (including a strong Presidential system), an increased social and political polarization and the elimination of any element of a liberal democracy (if there is still some in Turkey) apart the elections. 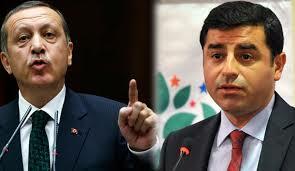 The democratic retrocession of Erdogan is evident already since some years, first of all with the failure of the solution of Kurdish issue, that arrived to target not only civilian Kurdish population besides the PKK in the Eastern regions, but also the first pro-Kurdish party entered in the Parliament, the HDP. Second with an “autoritarianization” of his executive, with the increased exclusion of secular forces in the government and in the bureaucracy of the state, from eliminating few years ago the last Kemalist elites, to eliminating the alternative Islamist approach to politics represented by Gulenists, considered today terrorists in Turkey, to also moderate parts of the AKP more recently, including the only diplomatic Prime Minister Turkey had until now, Ahmet Davutoğlu. Finally with the repression of civil society, from the journalists to the NGOs and the people assembled to protest in the streets to even incarcerating academics that signed petition to ask the government to defend civilians in Kurdish regions (being compared to the same level of terrorists). So did the AKP moderate political Islam experiment also failed, pushed by external factors but also because of not being able to be inclusive, as it has been for the Muslim Brotherhood in Egypt and the Ennahda in Tunisa, or will it be able to survive and improve with more inclusiveness and liberalism in the near future? One decisive factor in this will be if Turkey will soon win against Jihadist terrorism of ISIS, allowed to grow at the beginning by Erdogan as a tool against Assad and the Kurds, but that finally turned against him too (as usually happen with terrorism, Al Qaeda docet). Because if a government cannot guarantee basic security and safety to its population for a protracted period of time there is not much future for that government, even if it keep expanding the middle class and the economic development, unless it changes its policies both inside and outside the country. Will be Erdogan and the AKP able to create a more efficient and effective foreign policy with at the same time more inclusive and united government? A more efficient and effective foreign policy should be based on one side on a real fight to ISIS and on the other on a new diplomatic approach to the solution of the Syrian and Iraqi civil wars (as the excluded Davutoglu tried to do) including accepting the presence of Kurds at the negotiating table on Syria. Outside the country terrorism can be won with military and financial fight against the cancer born in the states and pragmatic diplomacy towards the states that host that cancer. Instead Erdogan until now kept the same narrative of showing muscles inside and outside, asking Turkish society and institutions to be strong and Western countries “to take a firm stand against terrorism”. He refused to start a real military intervention against ISIS with the support of some allies – not in the sense of NATO forces as Article 5 has never been invocated for terrorist attacks after 9/11 having become a routine unfortunately today – but in the sense of world powers like Russia, US or France, mostly affected by the Jihadist terrorism, and the regional powers more closely involved, in particular Saudi Arabia. And at the same time he gave complete power to the Army to repress the Kurdish movement, empowering the military even too much with the risk of possible backlashes, including the last coup as some analysts had foreseen. A more inclusive and united government is what a country instead needs at domestic level, to win against terrorism, as it can be really won only with national unity. Governments need to be strong but they need to be also inclusive if they want to be effective in the fight for a country survival in the long term. Governments need to have a broad political representation and also the support of a civil society that feel listened and included in the polity. This is the lesson we had in Italy for example in the 1970s and in 1990s, when we won both the Communist terrorism and the Mafia terrorism, because of political compromises and massive civil society participation. Instead Erdogan and the AKP regime are until now representing an increasing exclusive government. Will Erdogan and the AKP be able to create such shift in the foreign and domestic politics after the failed attempted coup or will they insist in the repression of oppositions in all level of society, from politics, to military, to civil society to foreign actors considered as scapegoat like the Gulen movement? Will a new form of “moderate political Islam” born soon in Turkey, taking from the lesson learned of the past AKP mistakes and bridging the gap between secular and traditionalist Muslims? Future will say but will not be easy, as even in Tunisia the balance between secularist forces and Political Islam is not able to curb the backlash from Islamist radical forces producing so many foreign fighters. But for now Turkey survived another military coup attempt. All opposition parties, including the pro-Kurdish HDP and Gulen movement, condemned the coup attempt and the supporters of Erdogan went to the streets blocking army tanks. We hope that also civilians opposing Erdogan will be able to demonstrate freely in the streets soon again.